Werner Herzog’s range of work across artistic disciplines is unequalled. He has directed over 50 films and 20 opera productions on six continents, and has published numerous books, screenplays and articles. Established as one of the leading figures of world cinema, he has developed a powerful artistic vision with a capacity for critical reflection. As a director, Werner Herzog challenges the lines between traditional, narrative feature and documentary film, and has even called his fictional film Fitzcarraldo the best documentary of his career. He proclaims that, “...it is possible to reach a deeper stratum of truth—a poetic, ecstatic truth, which is mysterious and can only be grasped with effort; one attains it through vision, style, and craft”. 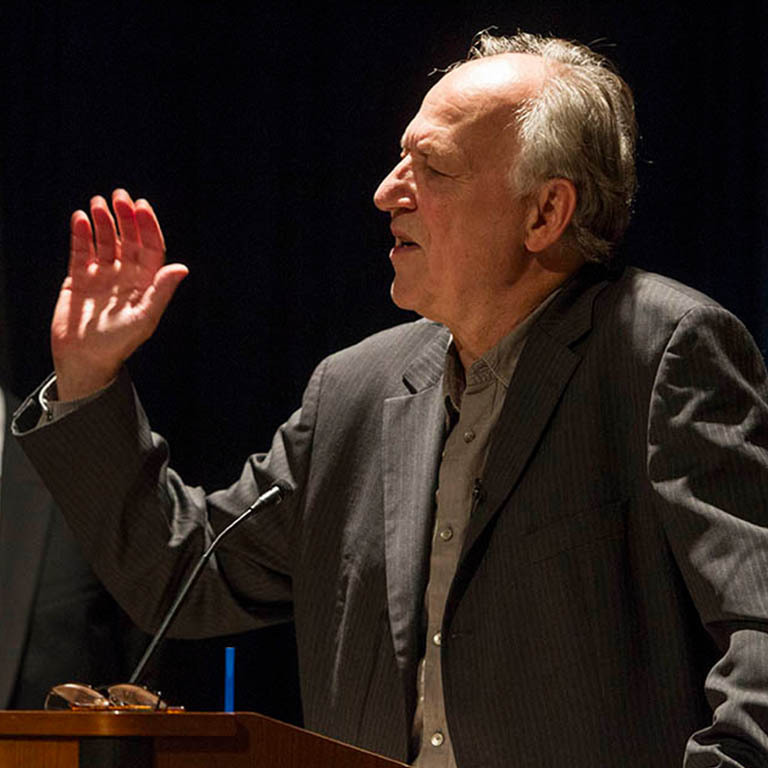 Werner Herzog on stage at IU Cinema with Indiana University president Michael McRobbie. Werner Herzog on stage at IU Cinema with Indiana University faculty.